1. 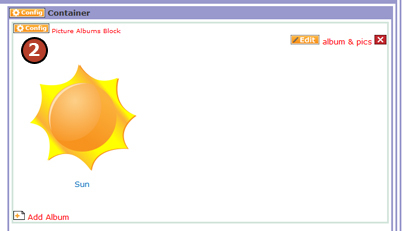 On the HotDoodle Toolbar, click to add a check to "Configure Blocks." 2. 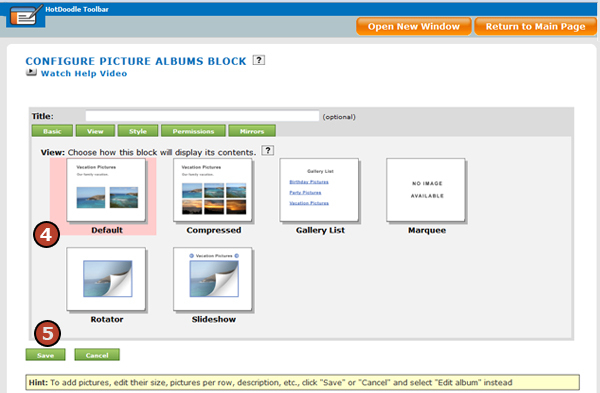 Click the "Config Picture Albums Block" link above the album you want to change the view on. 3. Click on the "View" Tab on the next screen. 4. Click on the view you would like to change to. Default - This view presents images in rows with spacing around each image. The images in this view are clickable and appear larger when clicked. Compressed - This view presents images in rows with less spacing around each image. The images in this view are not clickable. 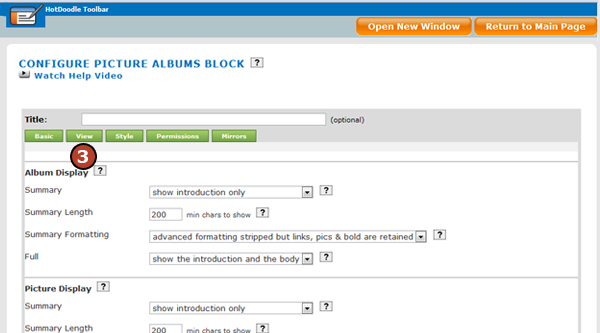 Gallery List - This view displays a list of albums with the titles as clickable links to open and view the album. Marquee - This view displays the images in a row that scrolls across the page. Note: the more images in the marquee, the wider the web page will stretch to fit all the images across. Rotator - This view displays one image at a time and switches images each time the web page is refreshed. This album holds many images, but only shows one at a time per refersh. Slideshow - This view displays one image at a time, but cycles through all the images fading out of one while the next image fades in. This album is used when you want to have a banner that changes images. 1. On the HotDoodle Toolbar, click to add a check mark to "Configure Blocks." 2. 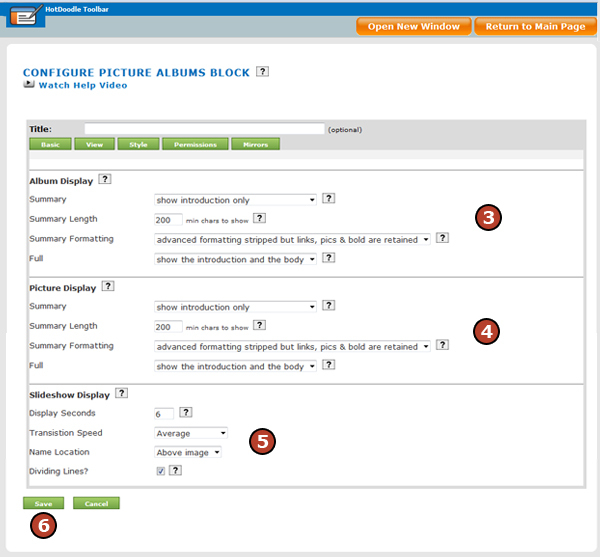 Click the "Config Picture Albums Block" link above the album you want to configure. 3. Choose Album description display options. 4. Choose individual image description display options. 5. Choose Slideshow display options.